Wednesday 6 February 2013, Nuclear AMRC. This event is fully booked – please don’t turn up if you haven’t registered. The Nuclear AMRC is opening its workshop to manufacturers, particularly smaller businesses, who want to find out more about how they can access our resources and support. 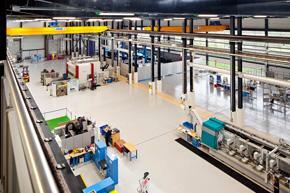 The Nuclear AMRC is here to work with UK manufacturers, from global giants to small local contractors. We work with businesses to develop innovative and optimised production processes, and to help them enter the supply chains for civil nuclear and other high-growth sectors. We are particularly keen to help smaller companies to innovate and succeed. The morning event on Wednesday 6 February 2013 will include short presentations about some of our core technologies, focusing on how SMEs can adopt the same innovative technologies and techniques as our leading global partners. You will also be able to network with our technology specialists and industry partners, tour our workshop and other facilities, and see the range and scale of our state-of-the-art manufacturing resources.